Notwithstanding this clear and explicit mandate, and eleven years after the Council’s establishment, member States are yet to put in place an explicit and coherent policy framework (e.g. a strategy, dedicated processes, tailored mechanisms) to fulfil the body’s prevention mandate. It is true that some steps have been taken to build a stronger prevention capacity. For example, taking forward an idea developed at the second Glion Human Rights Dialogue (Glion II) in 2015, the President of the Council convened a first informal ‘conversation’ with the High Commissioner (where the latter was able to brief members on emerging situations of concern). As of today, three such informal briefings have been held. In another example, building on an idea generated during Glion III, in June 2016 a cross-regional group of 32 states delivered a statement proposing a series of ‘objective criteria’ (i.e. the ‘Irish Principles’) that should guide delegations when considering which emerging situations might require/benefit from the Council’s attention. However, each of these developments, important as they may be, has happened in isolation and in a rather ad hoc manner. Against this background and building on initial discussions on the issue of prevention at Glion III, the fourth Glion Human Rights Dialogue (Glion IV, held from 18-19 May 2017) aimed to provide a platform for UN member States, the President of the Council, senior UN officials (including the Deputy High Commissioner and representatives of the Secretary-General), Special Procedures, NGOs, human rights defenders and others, to consider the precise meaning of paragraph 5f of GA resolution 60/251 and to generate ideas for its operationalization. Through inclusive dialogue, held under the Chatham House rule, the retreat sought to move the international human rights community towards a common understanding of the Council’s prevention mandate, and a common vision as to how the Council might turn that understanding into a practical policy framework. Glion IV also aimed to place that mandate within – and as a key component part of – UN Secretary-General António Guterres’ wider prevention agenda. Glion IV adopted a bottom-up approach to the issue of prevention, focusing on understanding the situation and needs of domestic stakeholders, and using that understanding to develop practical policy solutions at international-level. 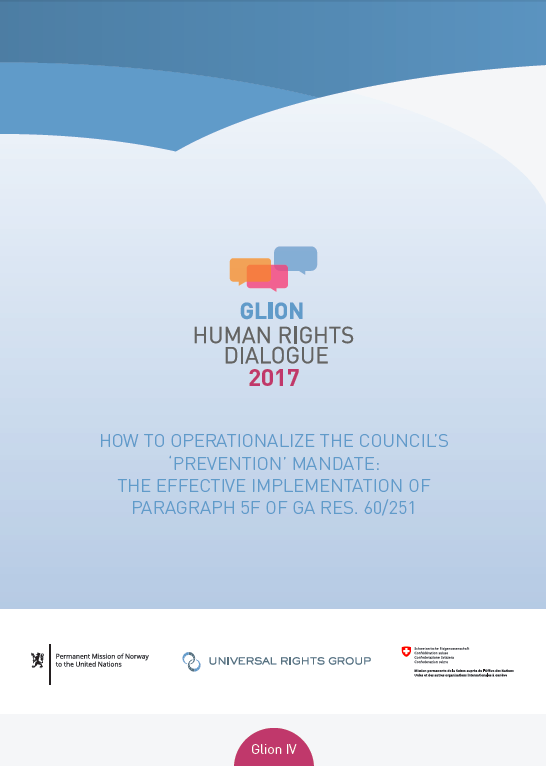 The report of the fourth Glion Human Rights Dialogue is an informal document summarising (in a non-attributable manner) some of the key ideas developed during the Glion retreat, and based on three policy dialogues which preceded it. The document does not represent the position of Norway or Switzerland, nor any of the participants, but rather is a non-exhaustive collection of ideas generated during those meetings. It is the hope of the organisers that these ideas and proposals will encourage and contribute to wider consideration by all stakeholders from all regions, thus making the Glion Dialogue a starting point for a fruitful and inclusive process. It is also the hope of the organisers that, where appropriate, States and other stakeholders will take forward useful ideas generated in Glion and thus contribute to an improvement in the Council’s relevance and impact in the field of human rights. Are we seeing a shift from ‘the era of declaration’ to the ‘era of implementation’ at the Human Rights Council? Are we seeing a new human rights 'implementation agenda'?